As a long-term World of Warcraft player, I’m still regularly astounded at the complexity and depth of the ‘game’. For the past couple of years, the Achievements system has helped to encapsulate the scope of WoW. At time of writing, there are more than 1400 achievements that range from pulling off 100 victories in a battleground to kissing a range of WoW fauna. 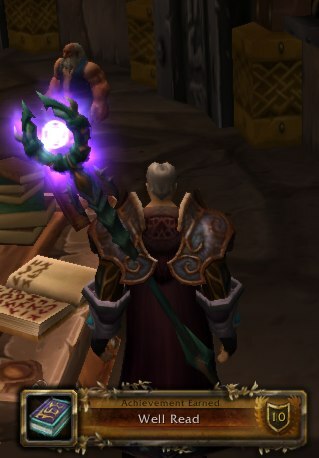 Any Level 70+ character is likely to be able to pick up the quest solo, with the biggest challenge being Scholomance. I recorded the location of each book as I did it, for your benefit – I tried to do it in the most time-efficient way as far as flight time etc. Of course, the list below applies to Alliance characters, Horde characters may want to check here for an alternate approach.